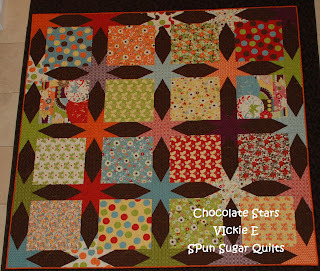 inspired by Momo's Freebird fabric and Marti Michell's quilt templates. Tell me you like it, cause I LOVE it..
With a name like Chocolate Stars how can you not love it!! But seriously, it is a beautiful design!! Just wonderful! Wonderful design ~ great work,I love it!!! It is so funny! Simple and easy to make and makes an interest illusion. I totally adore it!! You clever girl, I just love the design. Gorgeous!!! Alas, now there's another pattern on my ever-expanding "someday I want to make" list!!! What a fantastic quilt. I love how the pattern generates a circular design. Wow!!! It is wonderful! You are amazing! Enjoy the day! I love it - the chocolate browns are phenomenal. Wow this quilt is just fabulous! Love it! Love it! I love how you see circles even when everything's straight lines. Such a different design....great pattern and I love the fabrics too! I'm in love! You have such a great eye for design and color. 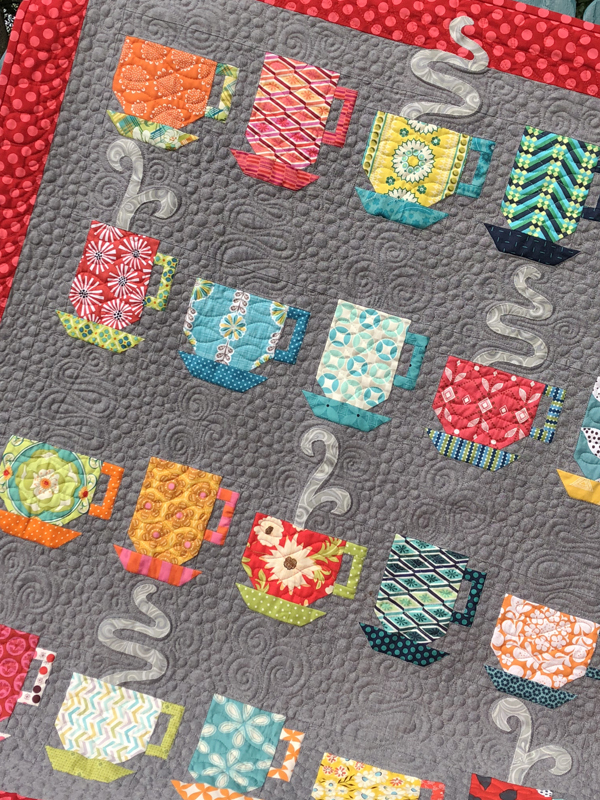 This quilt makes my heart go pitter pat! Very striking! The color choices really make the design POP! I LOVE it, Vicki. It's beautiful - way to go. Like it? I don't like it...I LOVE IT!! Beautiful work!! With a name like Chocolate Stars, how could you go wrong. Love it!! I love it, too! This one I'll definitely make! Thumbs up. I'm loving this quilt and the colors! Gorgeous! And what a great name. Yum. Wow - when I saw your quilt... it took my breath away. I LOVE IT. The colours are just great. Thanks for sharing your work. Wow!!! What a fantastic quilt. Congrats on the Moda post, this chocolate is yum! You have a really neat design here, the illusion of curves is cool. It's GORGEOUS Vickie! I love it!! I love it and the chocolate looks terrific. 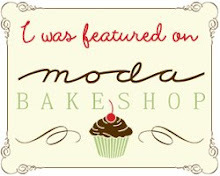 Congratiulations on another great project for the bake shop. It's a great one for showing off special fabrics. Good Morning! I just had to let you know how striking your design is. Fantastic!!! It's funny, I saw your bio and I'm kind of the opposite - I've always been a knitter, but just recently started getting obsessed with quilting! I just made a pillow with some Fassette fabrics - it's on my blog! 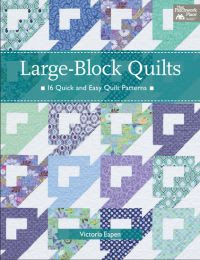 I love your quilts - i hate it when people immediately think "old fashioned" when they hear either quilting or knitting - so many quilts out there (yours included) are totally modern and cool! What a darling quilt! I love the stars, the material, and I think the brown shashing looks great! 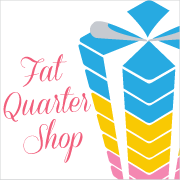 I'd like to share a link to your tutorial on sewwhattoday.blogspot.com on April 12! It's beautiful Vickie. I love the fabrics you've chosen to use! It is fantastic, beautiful and I love it. Lovely design and the fabrics are totally yummi. Great job ! Vicki! This is beyond amazing! I adore this, and might be coveting it right now... Thank you for sharing your wonderful blog.